After his pride and joy—a 2006 Donzi 35 ZR that ran 120-plus mph—was damaged in a garage fire at his home in Coal City, Ill., on July 24, 2011, 41-year-old carpenter Louie Marchese never in a million years would have believed it if someone told him his next boat would be the center of attention at the 2013 Miami International Boat Show. The Skater Powerboats 338 “Fat Boy” model from Douglas Marine on display in the company’s booth at the show proves that dreams do come true. Marchese’s stunning six-seater, which features a beautiful in-house paint design, is powered by twin 565-cubic-inch, Whipple-supercharged, 1,200-hp engines from Young Performance Marine that are connected to BAM Marine 1350 Cyborg transmissions and Arneson ASD7M surface drives (click here to see the pre-show OSO thread). 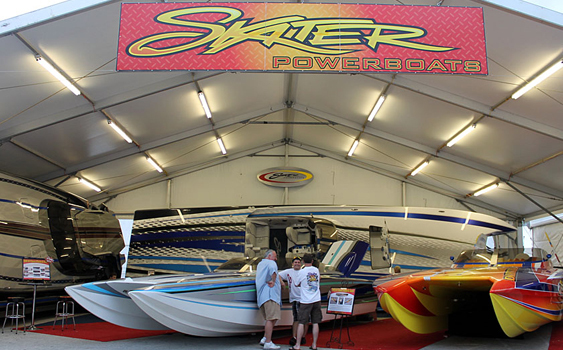 And there it was, front and center in the Skater booth with the mind-blowing Colledgewood hardtop cat, a beautiful 52-footer and the new Dirty Duck 38-footer. On the show’s first day, I found Marchese at the booth and he had a Cheshire-Cat-sized smile. And for good reason as the boat, although not completely finished being rigged, is one of the coolest Skater I’ve seen. I remember meeting Marchese, aka Crazy Dayz Donzi here on OSO, at the Lake of the Ozarks Shootout in Missouri some years ago. I interviewed him for a story after he battled with Southern California boater Ivan “Buck” Stracener—Marchese in his 35-foot Donzi and Stracener in his 34-foot Kachina. The two battled in the class for quite a few years and became close friends because of it. In fact Stracener came to Miami to spend time with Marchese and see the new ride. 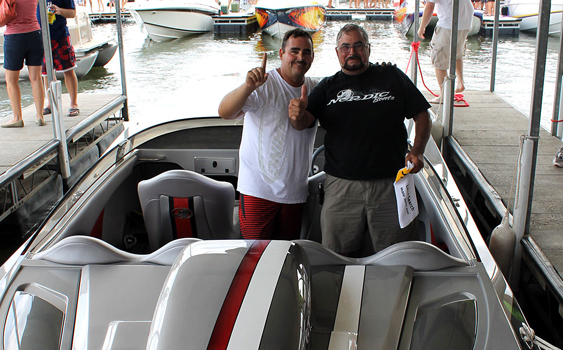 When I bumped into Marchese at the Shootout in 2011, he just finished throttling Stracener’s brand-new 28 SS catamaran from Nordic Boats to a class-winning138-mph pass. He told me the bad news—his newly repowered Donzi was damaged beyond repair when his garage was struck by lightning and burned to the ground. Fortunately the engine compartment was barely damaged and he was able to save the engines, which were upgraded to 4.0L Whipple Superchargers by Young just a couple of weeks before the fire, and put them in the 338 Skater. The two ran the boat again in 2012 and reached an impressive 148-mph top speed. Marchese, who has owned a Bayliner, a 22-foot Baja and two Donzis (the first time he ran the Shootout was in 2001 in his 28-foot Donzi), started looking at a variety of catamaran builders and ultimately settled on a Skater after talking with Douglas Marine founder Peter Hledin and receiving advice from Arneson’s Rik Wimp and Henry “Blume” Loe of Loe Marine in Texas. 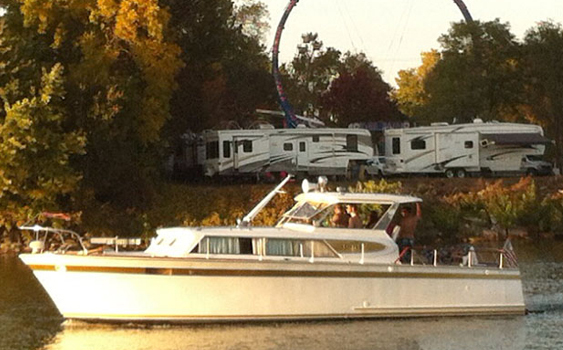 He also consulted with longtime friend and boat guru Tom McNabb of Capt’n Nabbers in Morris, Illinois. 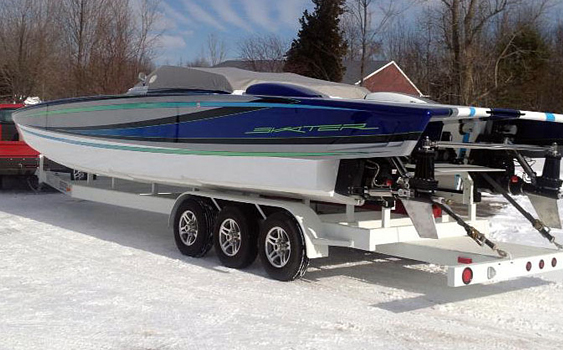 With a goal of making a huge splash at the 2013 Lake of the Ozarks Shootout, Marchese hopes to see at least 180 mph out of the 33-footer, which is actually Skater’s 30-foot hull with a transom bussell above the drives. He said he hopes to start dialing in the catamaran, which features a crystal-clear windshield from Aero-Marine, sometime next month with Young by his side, and have the boat ready in time for the Desert Storm Poker Run and the event’s Shootout. Along with the Lake of the Ozarks Shootout, Marchese plans to attend a handful of events such as the Boyne Thunder Poker Run in July, the Lake Cumberland Poker Run in September and this summer’s Flight Club SkaterFest in Michigan. And if he’s not running his Skater on the Illinois or Kankakee rivers, keep an eye out for Marchese and company in The Mary Rose. The steel-hull 37-foot Chris-Craft Roamer built in 1964 is quite the departure from the 33-foot rocket, but then again, you can’t fit 30-plus people on the Skater.